The hoovering machine mod. SPREADER AIR 1250 is entirely made of AISI 304 stainless steel materials. The machine is equipped with an electric fan mod. RM400 / 2, complete with a three-phase motor kw 4 – B3 – 2800 rpm, a connection with the suction net that allows dust on leather to be sucked and a hatch for the collection of dust-coated leathers. 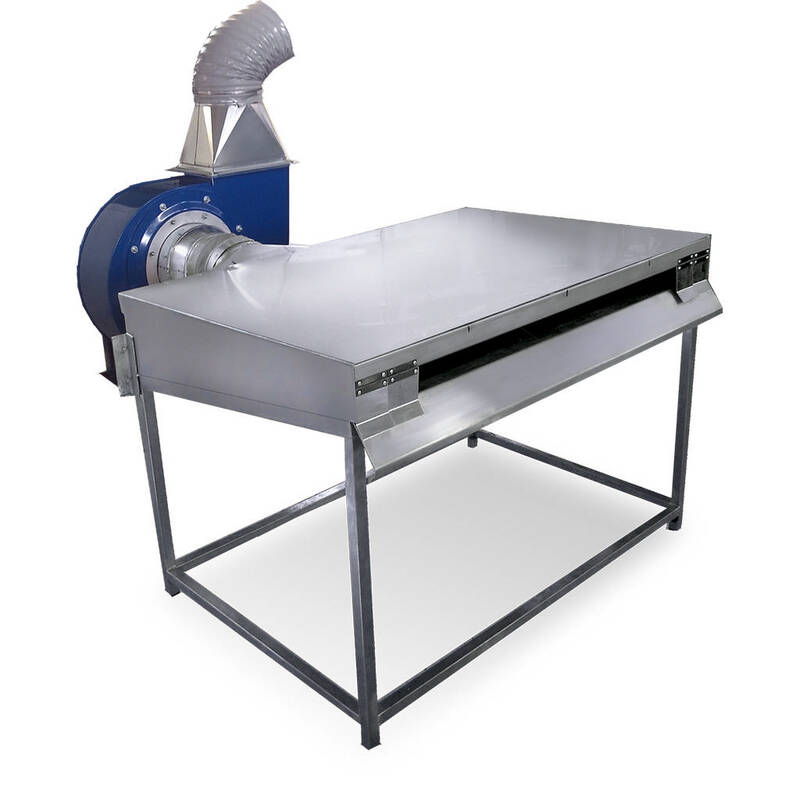 The machine must be used, after the pressing and the refining-grinding of the leather, to eliminate the residual dust that is deposited during the above-mentioned procedures. The machine must be connected to an air treatment plant for the removal of dust through a pipe of not less than Ф = 0.4 m.
On that note, we advise you to equip your system with our filtering system. The workforce using the machine must be trained and informed in compliance with Legislative Decree no. 81/08 on the potential risks. Particular attention must be paid to the analysis of the noise and vibrations to which the worker will be subjected; these variables are also influenced by the place where the machine will be installed. The use of ear protectors is mandatory because of the noise due to the strong suction, considering that the noise of the vacuum machine is 84 decibels and the operating machine can reach and exceed 90 decibels depending on the reverberation existing in the environment. It is advisable to place the machine in a soundproof box to reduce the emission of noise in the surrounding environment. You can equip your machine with the soundproof box of our production.